The small detail Hagel's conservative critics are leaving out. 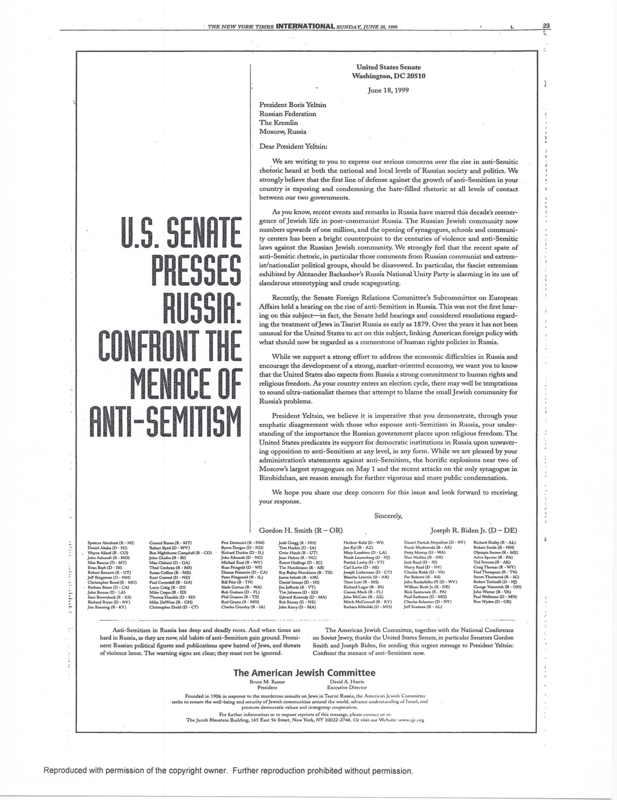 A 1999 letter from the American Jewish Committee (AJC) urging Russian President Boris Yeltsin to combat rising anti-Semitism in his country has been circulating in recent weeks, after Washington Post blogger Jennifer Rubin noted that it was signed by 99 Senators — but not Chuck Hagel. This scandalous tidbit was also picked up by the conservative Washington Free Beacon amid ongoing Republican criticism of Hagel, who was nominated today as Secretary of Defense. But both articles fail to include Hagel's 1999 explanation of why he didn't sign the letter. Hagel said at the time his policy was to never sign letters to foreign heads of state telling them how to handle affairs in their own countries, as it often served to alienate and embolden them. However, he said he took stronger and more effective action by writing directly to President Clinton, asking him to appeal to Boris Yeltsin to stop anti-Semitic acts in his country. "My intent is to find the best avenue, the best vehicle to effect change," Hagel said. "I think what I've done is far more effective than a letter that Yeltsin probably will never see." "Anti-Semitism or any form of religious persecution should never be tolerated," Hagel wrote in his letter to Clinton. "The United States should predicate its support for democratic institutions in Russia upon unwavering opposition to anti-Semitism and all forms of prejudice and intolerance within that government." Hagel said signing the Senate's letter would have been "a pretty easy way to get off the hook." He added that "my interest is not in getting some political points. I want to accomplish this in the best and most effective way." Nebraska Jewish leaders, although upset Hagel didn't sign the letter to Yeltsin, were happy he wrote to Clinton directly. Chuck Kuba, president of the Lincoln Jewish Federation, said he believed the Senate letter could "give added strength to Yeltsin in his demonstrated support for religious freedom" in Russia. "I absolutely do not consider Chuck Hagel to be anti-Semitic. He absolutely is not a bigot," Chuck Kuba, president of the Lincoln Nebraska Jewish Federation said according to the Associated Press. "He's a good man, and he has supported Israel. But I think he did not use sound judgment in not signing that letter." The Anti-Defamation League in Lincoln Nebraska also said "I'm glad Hagel wrote Clinton, but I wish he would have signed the other letter, too."